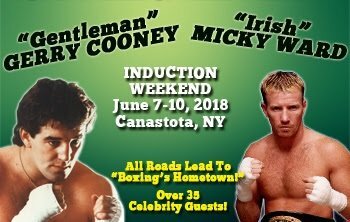 The International Boxing Hall of Fame announced today fan favorite boxers “Gentleman” Gerry Cooney and “Irish” Micky Ward are set to participate in 2018 Hall of Fame Induction Weekend festivities in Canastota on June 7-10th. From Huntington, NY, Cooney compiled a 55-2 amateur record before turning pro in 1977. The 6’6” Cooney utilized a devastating left hook to score wins over S.T. Gordon, Eddie Lopez, Dino Dennis, Jimmy Young, Ron Lyle and Hall of Famer Ken Norton to secure a 1982 heavyweight title bout with Larry Holmes (TKO by 13). He retired from the ring in 1990 with a 28-3 (24 KOs) record. Lowell, MA’s Ward turned pro in 1985 and used a crowd-pleasing style to register wins over Shea Neary, Reggie Green and Emanuel Burton among others. In 2002 and 2003 Ward engaged in an epic trilogy with Arturo Gatti (1-2). During his career, he was in “Fight of the Year” three times (2001 vs. Burton, 2002 and 2003 vs. Gatti). The Academy Award-winning motion picture The Fighter chronicled his life. An impressive list of over 35 boxing greats from the United States and abroad are scheduled to participate in weekend festivities including Mike Tyson, Miguel Cotto, Marco Antonio Barrera, Kelly Pavlik, Antonio Tarver, James Toney and many more.